Graduated from the Department of Electronic Science, Okayama University of Science. After joining Sega (later Sega Games, Sega Interactive) as director for arcade titles produced a number of hits including Hang On and Space Harrier. 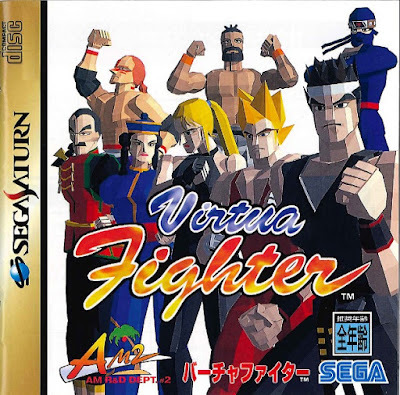 Subsequently worked on Virtua Fighter, the first proper 3D fighting competition game, creating a social phenomenon. In 1999 developed the blockbuster Shenmue which influenced many game developers as the forerunner of 3D open-world games. In 2008 he formed Ys Net as its CEO. His latest title, Shenmue III, is scheduled for release in December 2017 for PC and PS4. Major titles: Hang On, Space Harrier, Out Run, Virtua Fighter series, Shenmue and others. Graduated from Waseda University. 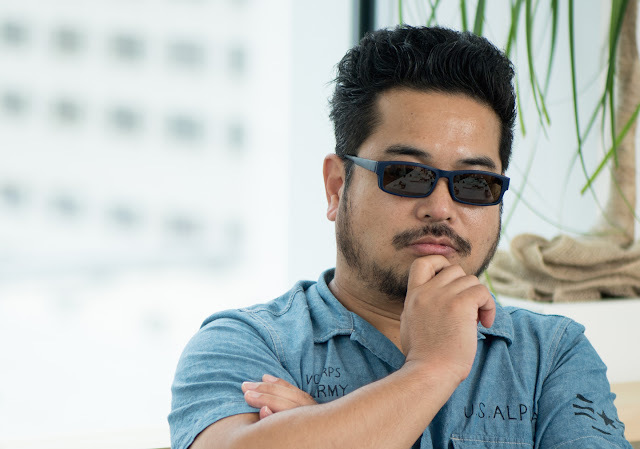 Has spent more than 20 years on action game projects such as Tekken and Soul Calibur. More recently has also been engaged in VR research with collaborative game ventures such as Pokken, and Summer Lesson. Has worked across a wide range of areas, including not only development work like building system scripts for animation control at the foundation of (former) Namco’s game engine, but also the planning and producing of games; sales; publicity activities; and right through to community management. Currently employed as section head of the Worldwide Planning & Development Unit for the promotion of the global business. Major titles: Tekken series, Soul Calibur series, Pokken, Summer Lesson and others. Major film appearances: The Next Generation -Patlabor-, TV drama series No Continue Kid and others. The Smithsonian Museum is situated on an immense plot in central Washington D.C. In it are housed a variety of mankind’s treasures: an airplane of the Wright brothers, who realized the world’s first powered flight; a lunar rock carried home on Apollo 16; and even the “cursed” Hope diamond which is known for bringing misfortune to its owner. 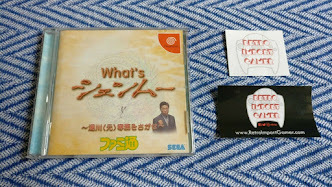 In 1998, a certain game developed by a Japanese was added to the collection. That game's name: Virtua Fighter. And its developer, who propelled Sega to become a global company with his "taikan" (ride-on style) games such as Out Run and Space Harrier, is highly acclaimed among Western developers even now: Yu Suzuki. We have previously reported on the early days of Japan’s game industry. However, compared to his huge achievements, Suzuki is someone who is much less talked about nowdays. In Japan, his name disappeared from the lips of game fans around the time when news about the follow-up to the Dreamcast’s Shenmue series started to fade. However, how about overseas? 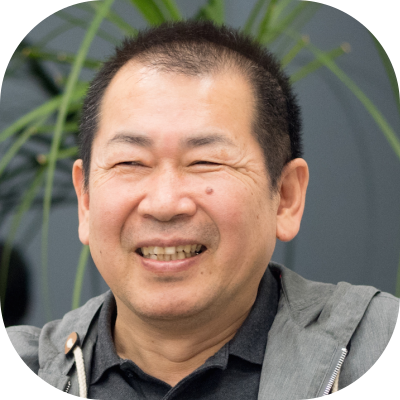 As the originator of the open world that can today be found in the AAA mainstream titles sweeping the world, words of respect for Shenmue and Yu Suzuki never cease. 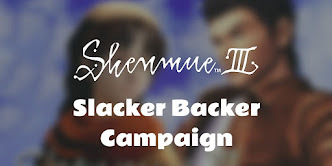 Reports are frequent of the frenzy of game fans when he attends an event overseas, and crowd funding of Shenmue III reached $2 million within its first day, setting a new Guinness record. 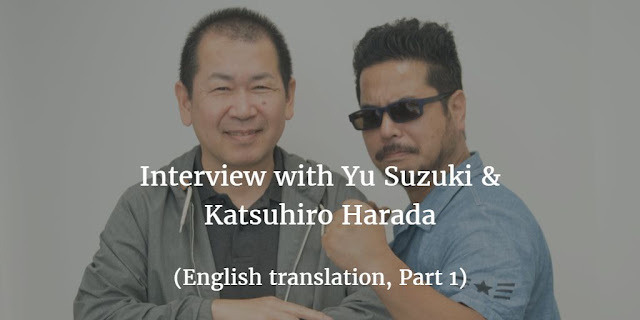 Someone in Japan who always speaks of Yu Suzuki with respect, and who joins Yu Suzuki in our conversation today, is Game Director of Bandai Namco Entertainment, Katsuhiro Harada. 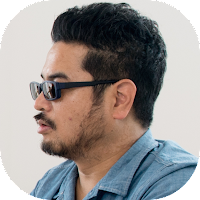 Famous for the popular Tekken fighting games and more recently Summer Lesson on PS VR, as a child Harada was hooked on ride-on games like Out Run and Space Harrier, and relates that for a long time Tekken took its inspiration from Virtua Fighter. Harada has recently been involved with game development using new VR technology, and says this has made him realize over again how remarkable Yu Suzuki was to pioneer an entire technology in a place where games had not yet been established. What’s more, he makes the intriguing comment that Yu Suzuki’s ride-on games "anticipated" VR. What on earth could he mean? The two developers cross the generational line to talk on the topic of challenges with respect to games. Q: I’d like to turn to Shenmue, the home console game released for the Dreamcast. 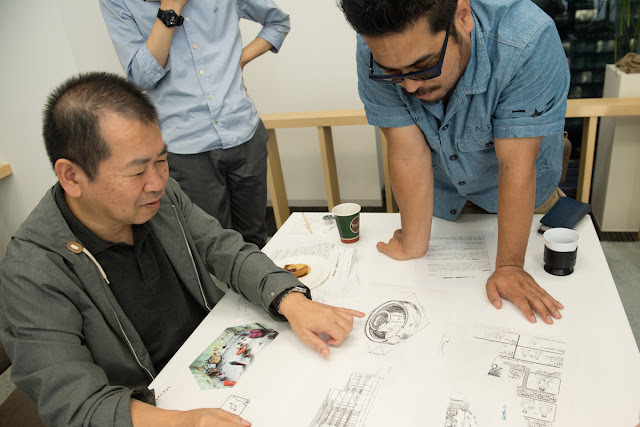 Yu-san, today you’ve brought along some of Shenmue’s design documents for us, haven’t you. YS: Shenmue is huge, so this is just a few of them. The ones I've brought include a “Tile Breaking” event that we were thinking about back then! KH: Oh! Like the bonus stage in Art of Fighting or Street Fighter. 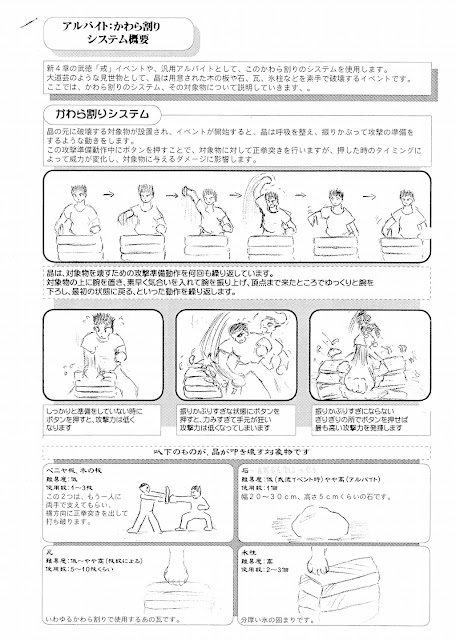 The illustrations in the QTE [=Quick Timer Event] storyboard are well drawn too, aren’t they, like a manga. YS: Also I’ve brought along this new castle which will appear in Shenmue III. Q: What? A design document from the latest sequel that made waves on Kickstarter! KH: The design even details the dimensions, doesn’t it. YS: That’s because with Shenmue, we’re working with a top architect that I know, to create rooms that could actually be inhabited. A "new castle which will appear in Shenmue III." Q: Even so, from the Kickstarter I realized anew just how hugely popular this game is overseas. YS: Several people brought their Dreamcasts too, didn’t they. 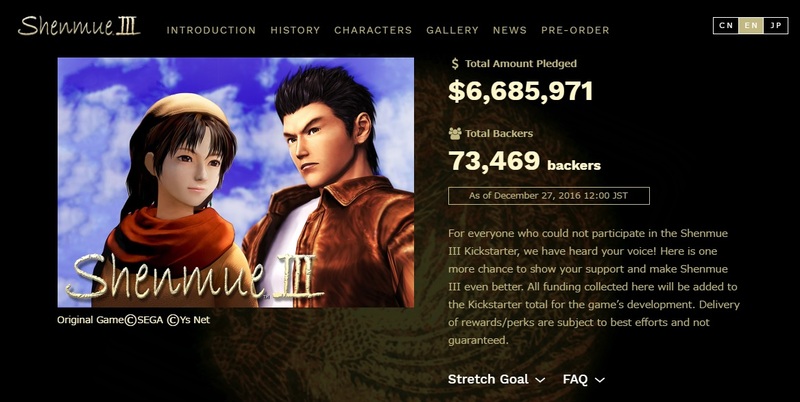 The split was about 80% for Shenmue, 10% for Virtua Fighter with the rest being for others like Out Run and Space Harrier. KH: I started to wonder if it was a Shenmue event! They were probably all Kickstarter backers too [laughs]. They all turned up with game packages. Q: In actual fact, I don’t think it’s a title that sold very well in Japan, so what do you think is the reason for the great acclaim it enjoys overseas? YS: Basically my games have sold well globally, fortunately [laughs]. This has been the case since the days of Out Run and Space Harrier, and that’s because I always incorporate fundamental concepts, within universal themes. One example is the decision to use a vehicle in which males all over the world have an interest: the car. It’s important not to forget aspects like this. With Shenmue, I made the concept for the story a global theme. As you know by watching Hollywood movies, the stories that become worldwide hits are about love, courage, friendship and love of family. And the plot of this story - “A son whose father is killed goes on an adventure seeking vengeance” - is one that resonates with people the world over. Making a game world that has impact is also important. Deliberately presenting an Eastern world can pique the interest of people in the West. Juzo Itami’s The Funeral is a movie that shows Japanese customs and daily life in great detail, and in it there’s a scene where people’s legs start to get “pins and needles” as they sit with their legs folded underneath them. The part where they are shown wriggling their numb big toes is something that makes people around the world chuckle. The Funeral: a 1984 movie, and the first that Juzo Itami directed. It was the first work to deal with the topic of funerals, having been until that point a somber topic, and it comically depicts the confusion of a family and those around them with their first funeral. Q: I see, and is that why you chose the setting of Yokosuka, Japan? YS: Yes, since I used to hang out in Yokosuka a lot. However, at that time Japanese culture was already growing closer to those of other countries such as Korea and China, so it would have reduced the impact. So I decided to set it back in around 1986, in the Japan of an older era but one for which we would still be able to interview some of the old Yokosuka townsfolk. Q: The factors for its success were already being incorporated in a logical manner during the first part of your project, weren’t they. YS: It’s hard to predict what reactions will be like though. 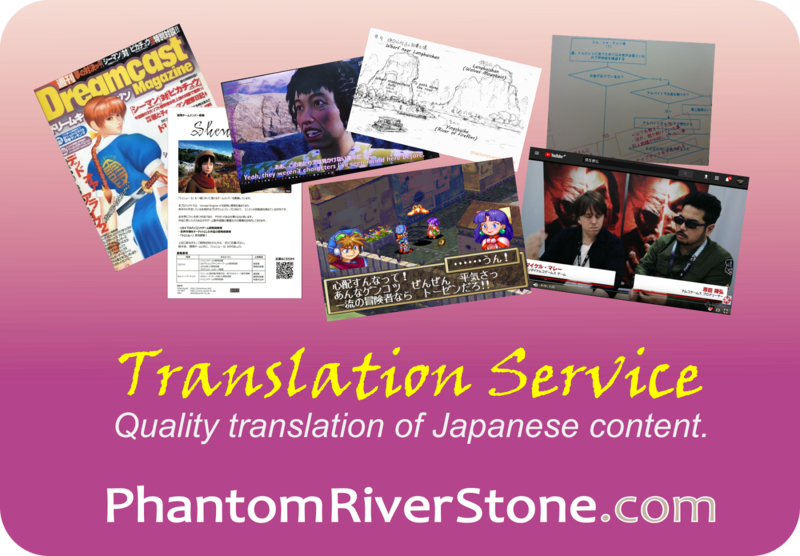 For example, someone overseas made the comment: “I was impressed that the protagonist, Ryo, says 'thank you' after asking people the way to go.” They said that in their country, people don’t say thank you even when they're asking for directions [laughs]. YS: Differences in culture lie in that kind of everyday thing. Religion is the one thing I take care not to force on people, but I want to bring out the culture strongly, and want people to play with a sense of unity. And at that time there wasn’t any internet, which I think made Eastern culture even more unusual. KH: I also think that’s a big factor. For Westerners the game’s world has a strange unfamiliarity about it, and overlaying advanced technology on top made it really interesting for me. With later open-world games where you can do anything you want, such as the criminal-depicting Grand Theft Auto, there had been a tendency to end up with a bland world. To put it another way, Shenmue was something that only the Japanese of that era created; and I think it was effectively a "game that couldn’t be made”. It had the financial might at the time of a Japanese game company; the concept of an “engine” had at last been conceived in a forward-thinking development studio; and at a time where it had now become feasible to build something large-scale, all the techniques of what we would now call an “open world” were put into the implementation. 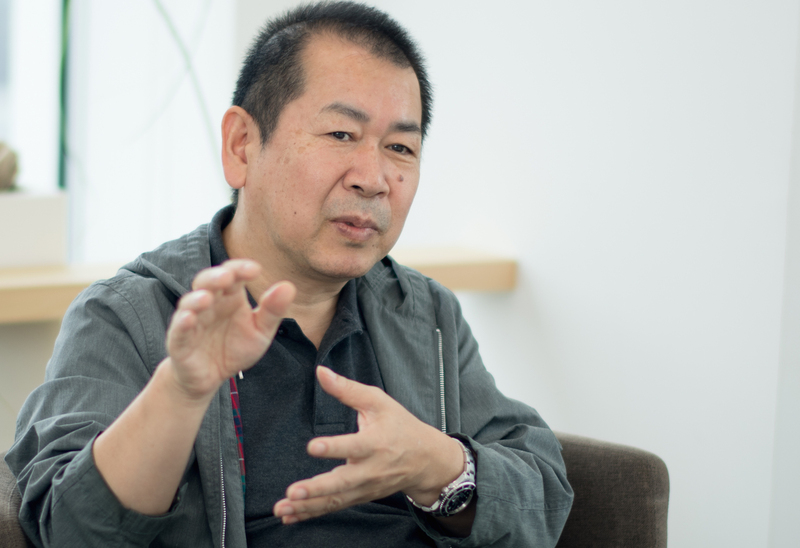 Developers of AAA game titles in the West such as Grand Theft Auto that have sales in the tens of millions of copies speak of their respect for Shenmue and Yu Suzuki. I have a feeling that the achievements of Yu Suzuki the game creator continue to be talked about even more overseas than in Japan. KH: Yes, in Europe and the US, society greatly respects people who take the first step with technology. That may be one of the biggest differences between game development in Japan and the West. 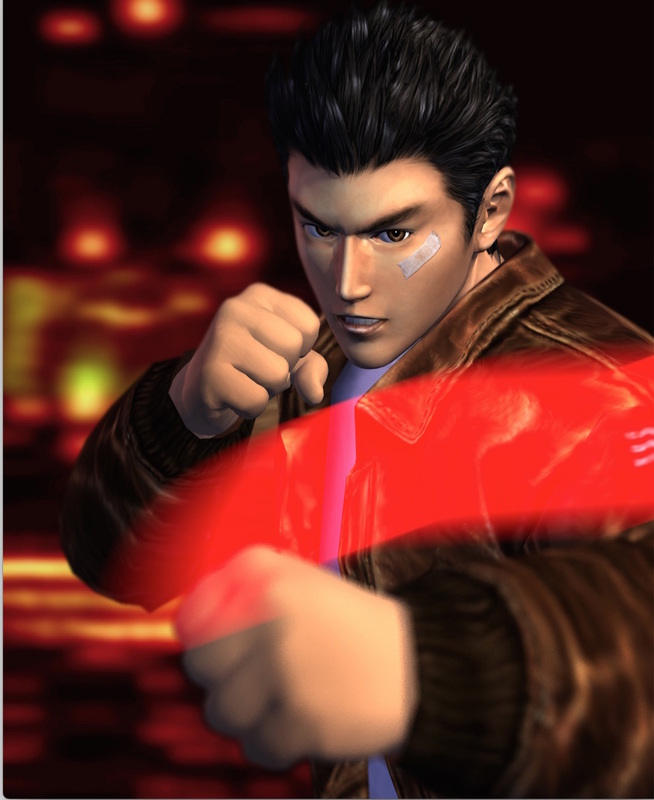 After all, at the time of Virtua Fighter, people overseas were leading the way in CG research, but due to the unexpected existence of someone like Yu Suzuki in game development, Japan led the field just for an instant. However, in the meantime overseas they were introducing Hollywood talent and investing huge sums to push ahead with scientific research... It’s from understanding leading-edge technologies that one knows where to invest, and they saw that... And I think now there’s a situation of this gap that’s been formed. From that point of view, Shenmue was an attempt at something that was too far ahead of its time, wasn’t it. Your story up until Virtua Fighter was pretty amazing, but with this game I have the impression that most people couldn’t keep up with your concepts. Having trouble being understood is something that I'm used to, since I have always been trying to do something new. But with development by a large team, you need to have everyone under the same banner for a cause they can understand, and with a shared concept in mind. I was at a loss. KH: I had the same kind of thing when I started VR. I think I can somewhat understand how you felt at the time. YS: I didn’t know what to do; I tried things like composing a four-part muscial piece that expressed the themes... but it still didn’t carry across. Q: It would be tough to reach an understanding from that, I would imagine [laughs]. So in the end, what did you do? YS: In order to realize a cinematic game, I brought together a movie director and a producer and so on, but that didn’t work out either. The vocabulary of games didn’t transfer across at all to movies. KH: Ah, I suppose not. YS: Furthermore, following the movie person’s instructions we brought stage props into a warehouse and built a set there for motion capture, and made clothes that were the same as Shenhua’s and so on, and the costs grew and grew. Everything had to be made by the specialist staff member, so things got out of hand. We did ask ourselves whether all this was really necessary, but this was our first time so we weren’t able to judge. In fact, the clothes turned out to be particularly costly. KH: Boy, no one does those kinds of things, even now [laughs]! Q: I was thinking that maybe you could go to the Comiket [Comic Market] and find a cos-player who’s good at sewing [laughs]. YS: In the end, even though we followed that person’s advice, it didn’t work out. The new person we got to replace him was wonderful, but he was never on time. Having no choice, we arranged to have someone to keep hustling him along [smiles wryly]. KH: Hmmm [smiles]. But the method of using industry people or technicians from the movie business is something that developers in the US have had great success with in the past. In particular, big improvements were made to FPS-style games after the genius of Hollywood flowed along to the developers. So Yu-san, you were ahead of the times there as well. Q: Even so, I’d like to learn why you went to such lengths to create a “movie-like” game. In the first place, what are your thoughts on the relationship between movies and games? 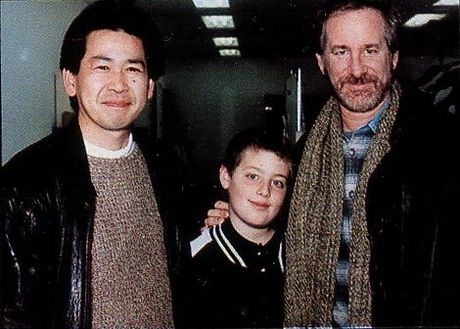 When [Steven] Spielberg once visited, bringing along his son Max, he asked me for my autograph. That was an unexpected turn of events [laughs]. That’s when I saw that Spielberg is quite playful: he whispered close to my ear, “Children always prefer games”. Apparently Max was a Virtua Fighter fan. Q: So that’s what led to Spielberg asking for your autograph. YS: That’s what being a parent is about [laughs]. But there’s another truth contained in this story: that children do indeed prefer games to movies. Movies are over after seeing them once, which for children is boring. Games can be replayed, and what’s more you can participate in them. The biggest attraction of games lies in their interactivity. YS: Conversely, the good thing about movies is that there is no interactivity. You can watch one no matter how tired you are. The attraction of movies is that they are non-interactive, there is a wide range of them, and they are readily accessible. YS: Games are complicated, which makes them interesting, but on the other hand they have limited adoption as a form of recreation. Movies are simpler and more easily-accessible, so they have a broad audience, you see. So no matter how movie-like the graphics produced on a games console become, and how close the two appear to be, underneath they are quite different in nature. If you misunderstand their essence, it will lead to failure. KH: Indeed. You know, that’s exactly right. YS: By the way, something that’s even more accessible is music. No images are needed, and there’s no restriction on location. That’s probably why it is the the most widely popular form of entertainment. Q: What’s more, with recent music festivals, unlike at a movie theater you can leave when you like, and eat, drink and chat as you watch, can’t you. But, if that is your point of view, why did you create a game based around the “cinematic” concept? YS: At the time, a game was released that had a movie-like cut scene, and I had a look at it for reference. However, the gap between the high-quality movie and the quality of the in-game graphics was so great that it made me recall watching Kyojin no Hoshi (Star of the Giants) as a child, and the moment when the anime part abruptly joined on to a photographic image [laughs]. And I knew that there was something wrong about this gap. I wanted to create a single unified world, not one with this mix. In that sense, perhaps what I was aiming for was the “fusion” of a movie and a game. Q: Listening to this, I get the sense that you were consciously setting yourself apart at the time from those developers of games that wanted to be movies. For a start, they were targeting conventional RPGs and action adventures, whereas you were heading in the direction of something more like an open-world. YS: I had made a game in 3D with Virtua Fighter, so next I wanted to try increasing that parameter by an additional dimension. YS: If you have a 2D image and add a Z-axis of depth to it, it becomes 3D, right? So this time I wanted to add T, a time axis. Even if there’s a bag sitting in this location now, in an hour it may have been tidied away. Even a blue sky changes to the colors of a sunset with the passing of time. If you think deeply about what “existence” is, time is one critical element. KH: Trying to achieve that back then is truly amazing [laughs]! YS: That’s why, whenever I’m asked “What did you leave undone in Shenmue?”, I say “I really wanted to have ramen that has steam rising when first served; after a while the steam disappears and the noodles turn soggy”. Oh well, nobody gets what I mean though. Q: You’re a true philosopher [laughs]! In stark contrast to games that wanted to be movies, you produced something close to a movie by taking the approach of adding time axes onto a series of three-dimensional CG images. Upon hearing that, the impression the game gives to us somehow fits and feels convincing. So the breaking tile part time job or minigame won't be in Shenmue III? Yu was careful not to give away much about that! Although it was something designed way back, since it wasn't used in the first two games I'd say it would not be unexpected to see it in some form or other in Shenmue III. Meeeen thanks !!! And Happy new year!!!! EEEEEEEEEEEEEEEEE!!!! Happy New Year to you also - and to all the Shenmue fans!